Because we all need good news! Each quarter we enroll a limited number of interns in our 12 week program. Gain real-world knowledge as we design our internship specifically for you! 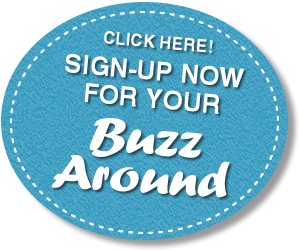 The Buzz Around is a weekly email newsletter reaching over 10,000 subscribers in 17 communities. We only publish the good news happening in our communities, and we work with local businesses to develop active marketing plans; introducing them to new customers. Buzz Around interns help us publish, promote and grow while gaining valuable experience in their field of study. The Buzz Around internship is at least 12-week program. Each student works directly with a staff member to establish specific goals and schedule that works for you. In addition, we have had accounting majors, business majors and graphic design majors; all creating their ideal internship with the Buzz Around. This is a great opportunity to gain experience and build your resume. Since we are intentionally aware of the challenges faced when entering the global workforce, the Buzz Around also includes training on Interfaith Communication. This curriculum from the Interfaith Youth Core was created by an interdisciplinary team of psychologists, sociologists and theology professionals to help students focus on their own personal stories as a way to have a foundation for reaching across boundaries and creating relationships with unfamiliar cultures and philosophies. The mission of the Buzz Around is to engage citizens in the power of community through local celebration of good news; providing news, marketing and educational services to residents, businesses and students in order to support the building of a sustainable society.